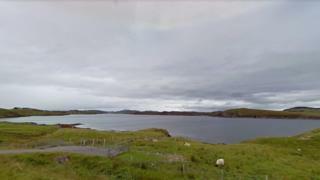 About 125,000 salmon have died due to a disease outbreak at two fish farms on the Isle of Lewis, BBC Scotland has learned. Marine Harvest confirmed that the sites in Loch Erisort have been hit by the bacterium Pasturella Skyensis. The company has apologised to local people concerned about the smell of decay in the area and the sight of lorries carrying away dead fish. The pathogen is believed to have taken hold at the farms at the end of August. One theory behind the emergence of the disease is that climate change and rising ocean temperatures could be making Scottish fish farms more vulnerable to bacterial infections. Infected salmon become very lethargic, stop eating and as the illness progresses it can prove fatal. Marine Harvest's business support manager Steve Bracken confirmed that the outbreak was "quite serious" and had taken its toll. "The mortality is in the region of about 500 tonnes," he said. "The fish are around about 4 kilos so it is about 125,000 fish we have lost during this period. "It's extremely unfortunate but we do see from time to time that there are these outbreaks of infections that are hard to explain. In this case we have seen it [Pasturella Skyensis] before." He said the pathogen was first identified at one of the company's farms on Skye in 2002. It was also seen there in the late 1990s but at the time the company was not sure what it was. "In its worst case it kills fish but it does respond to treatment and that is what we are carrying out at Loch Erisort at the moment," Mr Bracken said. "We use antibiotics to control the infection and it has taken time but we are seeing that the antibiotics are working. "I think we are through the worst of it, but we are still concerned of course and are not out of the woods yet. We are monitoring the situation very closely to make sure the disease is dying away." Lorries carrying thousands of dead fish have been a regular feature in the area over the last few weeks. Specialist contractors are being used to transport the carcasses to the central belt where they are put into an anaerobic digester and turned into liquid fertiliser. Marine Harvest said this was done in line with strict bio-security measures. In the longer term, it is hoped a vaccine can be developed for the disease, but for now the top priority for the company is to stop it getting into other sites. The concentration of fish in salmon farm cages is high and one infected fish could quickly spread the illness to thousands of others. Mr Bracken said the company had managed to stop it from reaching another of their fish farms in Loch Erisort, just one mile away at Tavay. The aquaculture sector in Scotland has been affected by serious problems with sea lice and amoebic gill disease and it's hoped that Pasturella Skyensis doesn't become a third major issue. Strains of the bacteria are present in wild fish which could be the origin of the infection, however, it is feared that climate change could be making Scottish fish farms more vulnerable to bacterial diseases. Not a lot is known about the infection but Mr Bracken said the company would learn a great deal more from this particular incident.